In 1845 a James Meakin manufactured at Newtown Works, Uttoxeter Road, Longton. Of his sons, James and George founded J & G Meakin (Hanley), while in 1874 another son, Alfred, founded Alfred Meakin at Tunstall. The company appears to have been the amalgamation of three separate factories (Royal, Victoria and Highgate Potteries). The families of Meakin, Johnson, Ridgway and Pearson were all related and their activities intertwined. 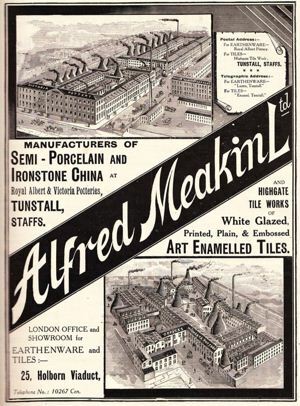 According to an 1881 advertisement, Alfred Meakin manufactured ironstone china and white granite ware, suitable for export. Examples of their ironstone export wares are illustrated in the Wetherbee and Heaivilin collectors’ guides. The company are reported to have set up their own methods of distribution in the USA and used the mail order catalogues of large US companies. Shapes such as Bamboo (1870’s-80’s), Fishhook (1880’s) and Chelsea were the most common. Alfred Meakin was one of the most prolific manufacturers of the Tea Leaf design, exported by many other Staffordshire companies following its introduction as a motif in the mid-1850s. Together with other simple designs it supplemented the plain white ironstone which was in common use in America. The motif was normally produced in copper lustre although examples of gold lustre have been found – the design was consequently also known as Lustre Spray. 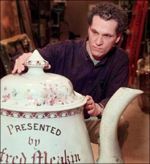 Production of the tea leaf design stopped in 1910. In addition to wares for export, ordinary domestic and traditional tablewares were made, such as the Bleu de Roi dinner ware, presented to King George V and Queen Mary on their 1913 Royal Visit to the pottery. Tiles were also manufactured by Alfred Meakin from the 1890s featuring art nouveau floral designs and the company were still reported as being involved in tile making in 1922. In 1932 children’s ware, such as Peter Pan and decorated wares, such as this hand-painted plate (See below) were being made. Art Deco designs were manufactured. A company promotional leaflet of 1949 states that they were famous for coloured banding. Their products were used on public transport such as the Flying Scotsman. At this time, there were over 1,200 employees and both bottle and tunnel ovens were in use. After moving to a new factory in 1957, many new tableware shapes and patterns were introduced. Some designs from the 1950s and 1960s are similar to better known designs, such as Midwinter’s Riviera or Cannes or Ridgway Potteries Homemaker and are typical examples of what many firms of the period were producing. The company employed 1,000 in 1973, and 2,000 in 1977. Myott-Meakin revived the use of the Alfred Meakin backstamp for bone china in 1985 but this range (some of which was manufactured in China) was discontinued late 1989/early 1990 to concentrate on earthenware production. The majority of Myott-Meakin production was exported.